Learners of all ages and backgrounds are engaged and immersed in exploring the universe for themselves. How does the universe work? How did we get here? Are we alone? NASA’s Universe of Learning is guided by NASA’s big questions for astrophysics and the needs of our audiences in the development of every product and program. The project stems from a unique partnership between leading scientific organizations that are home to missions and subject matter experts spanning the full range of NASA Astrophysics scientific research. Through this partnership, the NASA’s Universe of Learning team is able to uniquely engage youth, families, and lifelong learners in the science, the story, and the adventure of NASA’s scientific explorations of the universe. Rigorously evaluate our work to ensure we are creating inspiring, high-quality programming for our audiences. Interested in getting your science center integrated in the Universe of Learning? Contact us at info@universe-of-learning.org. Investigate the origin and destiny of our universe, including the nature of black holes, dark energy, dark matter, and gravity. Explore the origin and evolution of galaxies, stars, and planets. Discover and study planets around other stars, and explore whether they could harbor life. Visit NASA Astrophysics to get an overview of these programs. Learners have access to guided interactions with data from across the spectrum of NASA Astrophysics missions, presented in accurate, Hollywood-quality immersive experiences. We work with external evaluators and our audience members to conduct needs assessments and effectively identify and address audience needs. The partnership between NASA’s Universe of Learning and subject matter experts provides a direct connection to the science that is part of every program, product, and professional development experience. 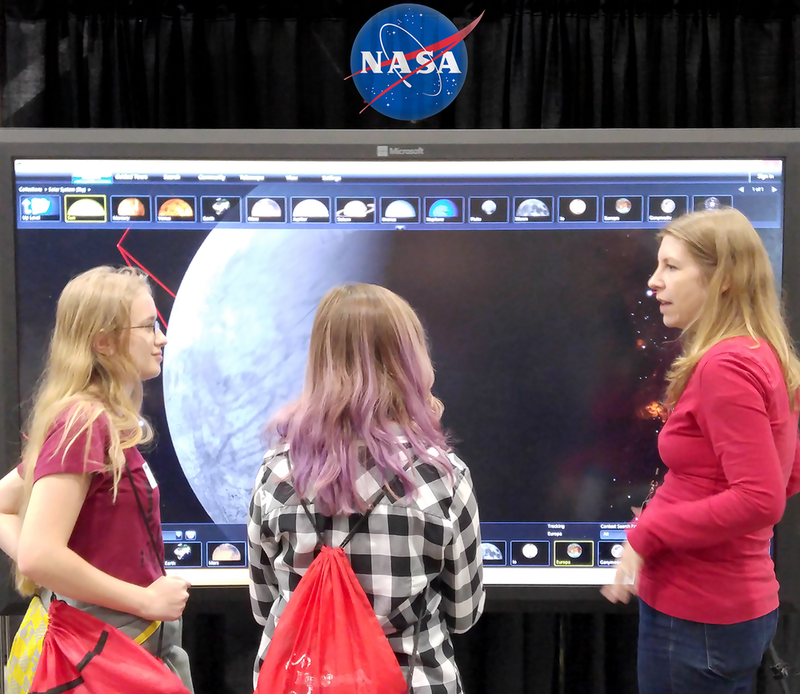 Subject matter experts are involved in a variety of ways, such as in-person guidance at a Girls STEAM Ahead with NASA event, or distance learning with the Science Briefings. The SMEs below participated in the monthly science briefings; their science briefings are linked in their captions. Scientists and educators work side-by-side to identify the aspects of astrophysics discoveries most relevant to STEM education and public understanding of science. Together they translate the content into resources and opportunities that respond to the needs of educators, youth, and life-long learners. We continually apply the most innovative technology to meet the needs of diverse learners in 21st century learning environments. As a member of the NASA Science Activation Team, the NASA’s Universe of Learning project is funded by and contributes to the NASA Science Mission Directorate’s broader goal of enabling NASA science experts and content into informal learning environments more effectively and efficiently, with learners of all ages. This includes collaborating with NASA subject matter experts to integrate compelling content from across NASA Astrophysics in innovative learning experiences. Providing direct access to this expertise enhances NASA’s ability to support national and local goals to improve learning and literacy in science, technology, engineering, and mathematics fields. The Science Mission Directorate is focused on the scientific exploration of the Earth, Sun, Solar System, and universe beyond that is enabled by access to space. The SMD gathers input from the scientific community to chart the best route for discovery, and it reaps the benefits of Earth and space exploration for society.